We built a wall! No, not that kind of wall (for those of you who are politically minded). 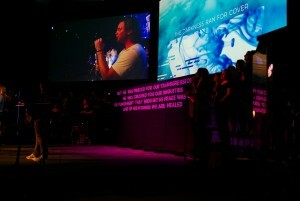 We built an 21 ft long, rotating message wall for a few creative moments during our last night of worship. This is one of those concepts that seemed easy in our heads, but ended up being WAY more work than anticipated. However, the vision eventually came to life and helped us with a few “reveal” elements in our service. Thanks to all of our RC Creative volunteers that helped! Find out more about what we did inside today’s post! 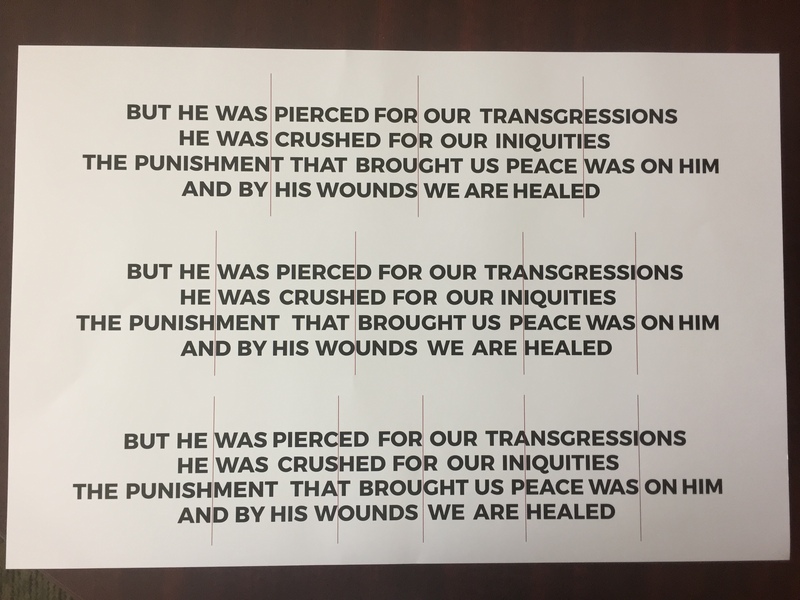 These phrases alone don’t necessarily make sense together, but they do communicate emotions and sentiments that are associated with the resurrection story. As we opened the doors and people began to stream into the room, there were a lot of semi-confused faces as they read the the center stage wall. After an opening video put context to the “partial understanding of the Messiah concept”, we began singing Passion’s “Worthy of Your Name”. At this point, we had a live choir enter from both sides of the stage. 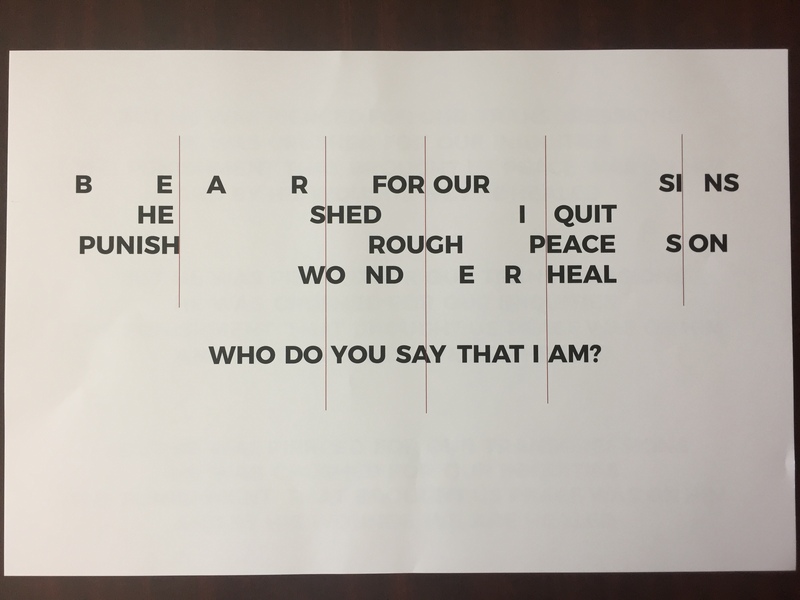 Each choir member had a letter in their hands, and before they took their place on the risers, they placed their letters on the wall, revealing Isaiah 53:5. We concluded the service with “Death Was Arrested”, but only through verse three. The last words we all sung together were, “Our Savior displayed on a criminal’s cross. Darkness rejoiced as though heaven had lost.” You could see the anticipation in the crowd as they waited to yell out, “But then Jesus Arose!”….but it didn’t happen. Instead, Russ walked onto the platform and put our people into the disciple’s shoes. Jesus had just been killed. They were heartbroken. They were confused. They were questioning everything they had given their lives over to over the past three years. For the next three days, they had to really wrestle with the question Jesus had asked Peter a few days before. “Who do you say that I am”. Our challenge to the church was the same. Who do we really believe Jesus is? Is this reflected in the way we live? Is it reflected in the way we pursue the lost? Is it reflected in our brokenness? We didn’t leave our people with a resurrection, but this simple question. And they had 7 days to reflect, pray, and meditate on the state of their heart and faith. The moment was powerful and intense…and the conversations that came afterward were great! Thanks to the all of volunteers who put in a ton of hours to help us pull this off. We had around 15-20 non-staff members of the creative cloud drop in throughout the week to help us build, paint, nail, and practice maneuvering this thing. This is just another example of how RC Creative makes Rush Creek better. We could do half the things we do without your help. Check out the gallery below to see some of the process!